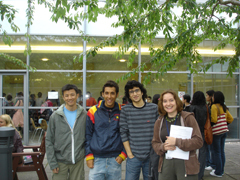 Between 2005 and 2010, eLanguages at the University of Southampton ran Arrive UK, a free tutored, pre-arrival online course, which was offered to all international students joining our Pre-sessional Course in EAP. Building on the wide success of this course, Get Ready for Southampton was designed and developed as a course that could be offered to a much larger number of students and include any international student or visitor coming to the University of Southampton. It is really fantastic as a first-time-used online course! It was great experience for me to do this online course. I received lots of benefits of talking online and sharing ideas and information. The exercises and materials are very interesting and helpful. I got much information about life in Southampton from these. Arrive UK is excellent and I did get some information about my School.